University of Minnesota football recruiting class has more quality, less quantity. Despite the Gophers' six-win improvement, bowl game and new stadium, Tim Brewster's recruiting pitch didn't work as well this year as last year. Barring last-minute surprises, the University of Minnesota football coach will introduce a top-50 recruiting class on signing day today, which isn't bad, but it isn't the top-20 class he pulled off a year ago after a 1-11 record in his debut. Brewster defended the quality of this class, saying its quantity dragged down the ranking. The Gophers had more scholarships available last year and signed 30 players. This year, only 18 players have orally committed, with possibly two more to come. But recruiting experts say the rankings are about quality and quantity. Scout.com and Rivals.com gave the average Gophers recruit virtually the same ranking this year as last year, but the Gophers have fewer high-end recruits this year. Last year, Brewster signed seven four-star recruits, according to Rivals.com, compared with two this year. Scout.com listed the Gophers with six four-star recruits last year vs. one five-star (receiver Hayo Carpenter) and two four-star recruits this year. than Minnesota." Rivals.com ranks Minnesota No. 46 nationally and No. 7 in the Big Ten. Scout.com ranks the Gophers No. 45 and No. 6, respectively. "This is a good follow-up class to last year, but not as good," said CBS College Sports recruiting analyst Tom Lemming, who ranks the Gophers in the top 40 this year. "Sometimes to have a great year, you need to have a year of great local talent. You also have to look at other things. Like, what happened with Minnesota's coordinators leaving, it's going to hurt a bit." Actually, a number of factors worked against the Gophers. Brewster made in-state recruiting the top priority when he took over in 2007. He landed five of Minnesota's top six players this year but missed out on the top senior for the second straight year. He lost Breck wide receiver Bryce McNeal to Clemson after losing Cretin-Derham Hall receiver Michael Floyd to Notre Dame last year. Unfortunately for Brewster, this was a down year for local talent, with Rivals.com ranking McNeal as the state's only four-star recruit. Scout.com was more generous, recently adding four stars to Washburn tight end Ra'Shede Hageman and Eastview defensive end Matt Garin, both of whom have committed to the Gophers. "Hageman might be the most talented kid they're bringing in," Scout.com recruiting analyst Allen Trieu said. "(Garin) went out to an all-star game in Hawaii and did really well. That's why we moved him up. We liked him from the start, but he proved himself against pretty good competition there." Next year's in-state class is expected to be better, led by Rivals.com's No. 1-rated junior in the country, Cretin-Derham Hall offensive lineman Seantrel Henderson. "We can win a championship with the core of our football team being from the state of Minnesota," Brewster said. "We had all the top juniors on campus (Saturday). We sat and we talked about making dreams come true in the state with Minnesota kids. I think it resonated very well." After a one-win season, with so many positions vacant, recruits last year knew playing time could come quickly. Five losses to end the 2008 season showed the Gophers still can use a talent upgrade, but they were one of the youngest teams in the Big Ten Conference and lost a total of only four starters on offense and defense. The 7-1 start helped attract some high-profile out-of-state recruits for visits, including the top defensive tackle in the nation, Sheldon Richardson of St. Louis; four-star cornerback Michael Carter of Florida; and four-star tailback Ronnie Wingo Jr. of St. Louis. But none picked the Gophers. Two four-star running backs, Texas natives Eric Stephens and Hasan Lipscomb, originally committed to Minnesota, but only Lipscomb is coming. Stephens opted for Texas Tech, saying he committed too quickly to Minnesota after being impressed by the Gophers. "They blew me away," Stephens told RedRaiderSports.com about the Gophers. "The coaching staff was great." Lipscomb knew there would be competition next season, with three tailbacks returning who started games last season but wasn't put off. "It's part of the recruiting process when a coach tells you you're going to play," Lipscomb said. "I know they have guys coming back, but I feel like I can make an impact instantly if I just work hard and compete." A new NCAA rule, adopted in January 2008, prohibits head coaches from visiting high schools during the spring evaluation period. Brewster, a master recruiter, stewed about being stuck in his office from April 15 to May 31. "I just think that the rule serves the guys who don't want to get out and work," Brewster said. "That's unfortunate. Some people are at places where, as head coaches, they don't have to get out and sell their universities as much as I do." Coaches could no longer visit with recruits' coaches, teachers and counselors during that time, preventing them from "accidentally" bumping into recruits. "The excuse for not allowing us to go out is the so-called 'bump rule,' " Brewster said. "That's where coaches are bumping into players in a so-called non-contact period. I think that's overplayed. That's a poor excuse to keep us off the road." Lemming said the spring was a key period for Brewster in landing the 2008 class. "More than anyone else, it hurt Minnesota," Lemming said of the new rule. "Tim got a huge advantage by going out and visiting schools. He was the face of the program. Tim was everywhere in May. I saw him all over. It's a crazy business because once an aggressive coach gets an edge, the lazy coaches try to cut it out." 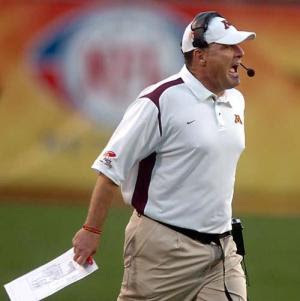 Gophers offensive coordinator Mike Dunbar and defensive coordinator Ted Roof both resigned on Jan. 6. Within days, former Nebraska defensive coordinator Kevin Cosgrove replaced Roof, although defensive backs coach Ronnie Lee will share the title. It took until Jan. 21 to land former Denver Broncos assistant Jedd Fisch to replace Dunbar. "(Cosgrove) come in and hit the ground running," Brewster said. "I don't think we missed a beat at all there. (Fisch) has had more of a limited amount of time to help us in recruiting, but he's already got a bunch of kids excited about the opportunity to play in his offense." A year ago, the Gophers were willing to take a chance on at-risk players academically. They signed two four-star players, defensive lineman Tim McGee and wide receiver Vince Hill, who in the end were not admitted to Minnesota. A third, quarterback MarQueis Gray, sat out the year because of issues with his ACT result but received a qualifying score during the season and has rejoined the program. This year, the Gophers appear to be taking fewer chances. Four-star cornerback Taikwon Paige of Georgia Military Academy had committed to Minnesota but was dropped because of academic issues. "We got some kids that obviously had some academic work to do from the signing day on last year," Brewster said.